Home NHL Opinion Will The Edmonton Oilers Become Trade Deadline Buyers? Will The Edmonton Oilers Become Trade Deadline Buyers? As the NHL schedule renews following the recent all-star break, the Edmonton Oilers sit three points out of a wild-card berth in the Western Conference. With the Oilers off until Feb. 2, they could fall further behind. In the wake of last week’s firing of Peter Chiarelli as general manager, NHL.com’s Dan Rosen wondered if they’ll be buyers or sellers by the Feb. 25 trade deadline. Following the Chiarelli firing and the announcement Keith Gretzky would take over as GM on an interim basis, The Edmonton Sun‘s Terry Jones reported team CEO Bob Nicholson said they wouldn’t trade any assets for a quick fix. He didn’t rule out making trades that could help them reach the playoffs but stressed they weren’t giving away the future. In other words, struggling but still promising winger Jesse Puljujarvi, 2017 first-round pick Kailer Yamamoto, and 2018 first-rounder Evan Bouchard aren’t available. One assumes they also won’t part with their 2019 first-round pick, which could become yet another first-overall selection should they finish low enough in the standings. Sportsnet’s Elliotte Friedman last week reported of speculation linking the Oilers to Washington Capitals winger Andre Burakovsky and Detroit Red Wings forward Andreas Athanasiou. He also mentioned talk of them discussing “something bigger” with the Chicago Blackhawks but provided no details. To land players like Burakovsky or Athanasiou, or to swing a big deal with the Blackhawks or another club, would require one or two of those future assets Nicholson insists the Oilers won’t part with. Speaking of Burakovsky or Athanasiou, it’s unlikely they will be available before the trade deadline. The Capitals have played coy over their plans for Burakovsky while Athanasiou’s future with the Wings seems more secure now than it was a year or two ago. Even if the Oilers try to become buyers, there’s no season-saving deal on the horizon. Just because Chiarelli isn’t the general manager anymore doesn’t mean interim GM Keith Gretzky can swing some kind of lopsided deal that magically turns the Oilers into a playoff club. There are simply too many holes in this roster. Recently re-signed goaltender Mikko Koskinen has outplayed former starter Cam Talbot, but the jury’s out on whether he can carry this club into the postseason. Puck-moving defenseman Oscar Klefbom will soon return from a broken finger, providing a much-needed boost to their blueline. However, they’ll also need better efforts from Larsson and Russell. 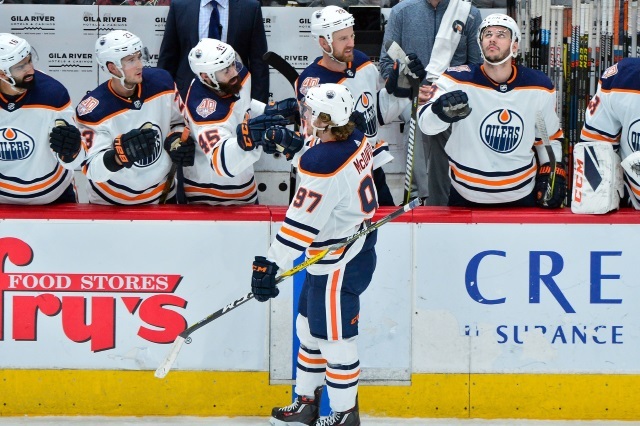 Forwards Connor McDavid, Leon Draisaitl, Ryan Nugent-Hopkins and sparkplug winger Alex Chiasson will undoubtedly give their all in a push for a playoff berth. Their efforts still won’t offset the Oilers’ ongoing lack of reliable secondary scoring. The Oilers are also hampered by limited salary-cap space. Cap Friendly indicates they have a little over $51,000 in cap room, with a projected $4.9 million by the trade deadline. Nobody’s taking fading veterans like Milan Lucic ($6 million annual average value through 2022-23) or Kris Russell ($4 million annually through 2020-21) off their hands. Same goes for blueliner Adam Larsson ($4.16 million through 2020-21) if his performance fails to improve in the coming weeks. That’s assuming, of course, any of them are willing to waive their various no-trade/no-movement clauses. More affordable Oilers such as defenseman Brandon Manning ($2.25 million through 2019-20) and forwards Zack Kassian ($1.95 million through next season) and Kyle Brodziak ($1.15 million, also through next season) could hit the trade block. However, they won’t fetch any kind of immediate roster help. Friedman mentioned they could attempt to move winger Tobias Rieder‘s $2-million cap hit to free up some cap room. Given his age (26), speed and RFA eligibility this summer, perhaps a taker could be found. However, it’ll cost over $2.2 million to qualify his rights plus he’s eligible for salary arbitration, which could dampen his trade value. The Oilers’ unwillingness to move future assets, a lack of attractive trade chips on the roster and salary-cap constraints don’t bode well for any efforts to land an impact player by the trade deadline. That doesn’t mean they won’t try but the chances of finding one appear remote. If the Oilers are to make the playoffs, they’ll need better performances from everyone on their current roster. They’ll also need some of the teams ahead of them in the standings to falter down the stretch. The Oilers cannot afford to fall much further behind. If they fail to gain ground over the next two weeks, they’ll be sellers, not buyers, by the deadline.